The repeated failure of the peace process in Israel-Palestine is also a failure of national and international politics to address the human rights of a people kept stateless by military occupation and exile. This report reviews the status of the “two-state” solution, but it does not engage in further political solutions-thinking, given the limited support for a Palestinian state by the United States and the international community in the face of Israeli government resistance. As a church based in the United States, we continue to believe that both Israel and the Middle East would be safer if Palestine were a free and viable state and not an arena for deep ethnic and religious hostility, a hostility that infects the profile of the United States and of Christianity in the region. 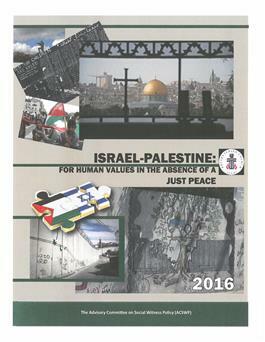 The Presbyterian Church (U.S.A.) in this report assesses the situation through a lens of Reformed Christian moral values and commitment to integrity, witness, and solidarity with the Christian community in Palestine and worldwide.